While INLANDERS might be the first to lend a hand in times of need, we’ll likely be the last to ask for one. That’s because we’re self-reliant islands of ingenuity. All 700,000 of us. We’re entrepreneurs, summit chasers, inventers, chefs, musicians, politicians and drifters — each flying his or her own flag. And we need one paper with the guts to salute them all. Because the more informed we are, the more independent we become. 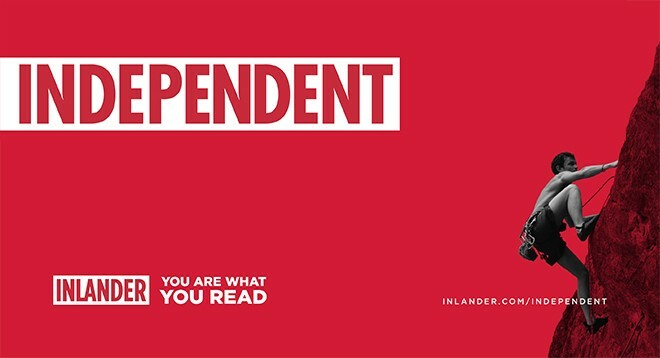 The Inlander was founded on independence — on the unwavering conviction that free and independent journalism helps a community thrive, that local ownership is best and that, in the end, a paper belongs to everyone. The Inlander is our name, but it’s also an identity, a frame of mind, a people and a place, bound by geography and core community values. The people of the Inland Northwest, we are all Inlanders. Our journey began humbly in 1993 as two brothers and their mom set out to create a new publication, a new voice, in their hometown. Today, with the same owners and the same pioneering spirit, the Inlander has become America's best read urban weekly, having enjoyed the nation's highest market penetration for the past decade. In fact, Editor & Publisher, the national journal covering the media industry, named us one of “10 Newspapers That Do It Right” in 2016. Our team has grown significantly over the years; talented journalists from around the country come here to be a part of something special. Indeed, in a time when other media are retreating — or abandoning their commitment to communities altogether — we continue to build on our success. We’ve added Annual Manual, the glossy insider’s guide to the region, and Health & Home, our six-times-a-year lifestyle and wellness magazine. We’ve also created The Menu, a directory of bars and restaurants, and Shop Local, a guide to spending your dollars right here. Online, meanwhile, traffic to our desktop and mobile sites is exploding as readers have come to rely on us for local news, to see out what’s happening in music, movies and events and to locate the nearest happy hour via our Drinkspotter app. Now, they come to play our video game, Inlander Dude. As members of the community, we also consider it a responsibility to add to its cultural vibrancy and in recent years we’ve convened several major community events, including Inlander Restaurant Week (with over 100 participating eateries in 2016); Snowlander Expo; and Volume, our annual two-day music festival in downtown Spokane. See our staff directory for more details.